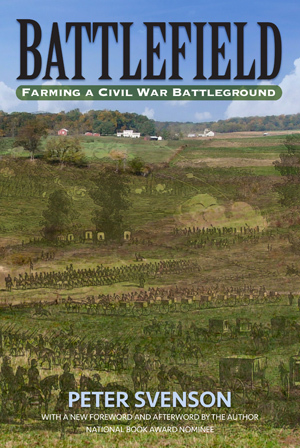 A finalist for the National Book Award, Battlefield chronicles the author’s experiences building a farmhouse on a forty-acre site near Harrisonburg, Virginia, which years before had been the site of the Civil War “Battle of Cross Keys,” in which Confederate forces stopped a Union advance and provided Stonewall Jackson with an important victory in his Shenandoah Valley campaign. Svenson intertwines a detailed description of the battle with self-deprecating accounts of a fledgling hay farmer attempting to farm his land while holding a new “army” of real-estate developers at bay. While reviving his long-neglected farmland, he unearths spent cartridges and artillery shells, and meditates on how best to commemorate the men who fell in battle on his forty acres. 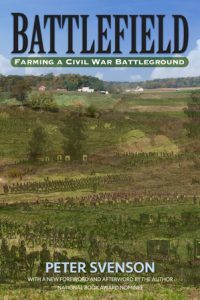 Exploring the intimate connections between landscape and history, Battlefield offers an engaging, reverent, and highly personal view of the Civil War and its ongoing legacy. PETER SVENSON is an artist and writer. A former resident of Cross Keys, VA, he now lives in Fayetteville, NY (Rochester area).